Fundraiser by Queer Kampala International Film Festival : Support Uganda's only LGBTQ Fest. Support Uganda's only LGBTQ Fest. Support Uganda's only LGBTQ Festival. The Queer Kampala International Film Festival is the first and only LGBTIQ film festival in Uganda. It offers a platform to promote the rights of LGBTIQ persons through Film Advocacy. QKIFF illuminates the diversity of Lesbian, Gay, Bisexual, Transgender, Intersex and Queer communities by providing spaces where queer films and stories are screened, discussed and celebrated. Its goals include pushing for legal reforms through expanding the network of LGBTIQ advocates, supporters and activists who can lobby the relevant authorities and stakeholders particularly politicians. QKIFF will prevent the discrimination of the LGBTIQ community through creating awareness to the general populace about the LGBTIQ community, which is done with an aim of changing perceptions and attitudes of the general populace thus reducing stigma and discrimination against the LGBTIQ community; and promoting production of quality LGBTIQ films by providing spaces where their films can be exhibited as well recognizing and awarding the brave filmmakers who daring enough to tell the suppressed LGBTIQ stories. The festival brings together filmmakers, researchers, activists, academics, lawyers, journalists and LGBTIQ persons from around the world. 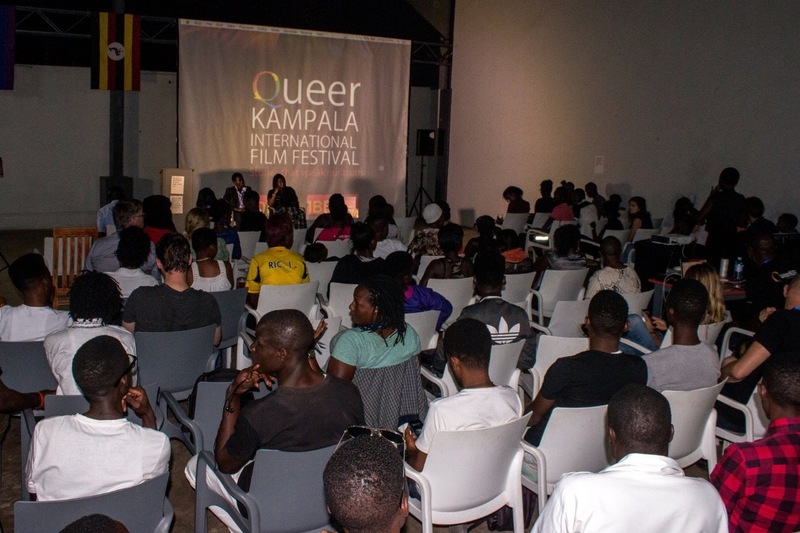 The inaugural Queer Kampala International Film Festival was held 9th – 11th, December 2016 at different venues in the country’s capital Kampala. Security measures included screening of attendees, keeping the venues secret and mobile daily. The attendants had to go to a different venue in the morning and afternoon. Venues were announced within hours to the event. Encouragingly, the LGBTIQ community, supporters and sympathizers hung in there and religiously followed us to the different venues attracting a turn up of more than 800 visitors with in a space of three days. Why we need your help! It is not only considered taboo and immoral to advocate for LGBTIQ rights in Uganda, it is criminal! Activism in this arena must be persistent in order to affect change. Through impactful film screenings, informative workshops and dialogues, lobbying of policy makers and bolstering relationships with our allies, we hope to make change a reality. This is only possible with the assistance of committed partners who share our vision and can provide the required resources including financial, moral and participatory support. We are most grateful for your encouragement and will march forward in the confidence that justice will always win, no matter how harsh the fight. Fundraising Campaign Goals Securing funding to realize our creative and advocacy objectives is critical at this time. We are working to raise at least $35,000 USD, a portion of our annual budget, as the bare minimum we need to execute QueerKIFF Film Fest/QueerImpact Lab2018. Our Annual Budget is $42,294 We are working to raise at least $35,000, a portion of our annual budget, as the bare minimum we need to execute QueerKIFF Film Fest 2018.